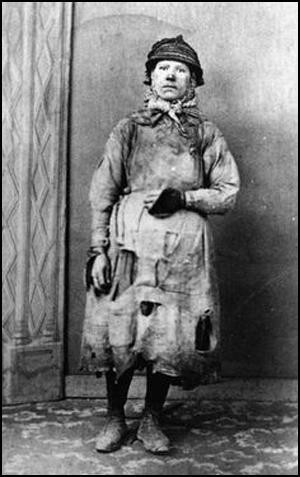 A serious accident in 1838 at Huskar Colliery in Silkstone, revealed that a large number of women were working underground in the mining industry. The story of the accident appeared in London newspapers and Queen Victoria put pressure on her prime minister, Lord Melbourne, to hold an enquiry into the working conditions in Britain’s factories and mines. The investigation was chaired by Anthony Ashley-Cooper (Lord Ashley) and over the next couple of years interviewed a large number of people working in Britain's factories and mines. Where possible, wagons carrying coal, were drawn by horses, and driven by children. However, in low and narrow underground passages, women were used to pull carts full of coal. The Children's Employment Commission published its first report on mines and collieries in 1842. The report caused a sensation when details appeared in newspapers. Within a week of the report being published Anthony Ashley-Cooper (Lord Ashley) gave notice of the Mines and Collieries Bill that he intended to take through Parliament. The measure was passed by the House of Lords on 5th July, 1842. As a result of this legislation all females and boys under ten years old were banned from working underground in coal mines. However, only one inspector was appointed for the entire country and so colliery owners continued to employ women and children in mines. The inspector later admitted that he would only enforce the regulations where a child had been killed in the underground accident. Even then, the fines imposed would often fall "not upon the colliery owner, but upon the father or the guardian of the boy". In 1850 the Commissioner of Mines, Hugh Seymour Tremenheere, estimated that "200 women and girls were still working in collieries in South Wales, many of whom were only eleven or twelve years of age". The government therefore increased the number of inspectors. However, Lord Ashley admitted that underground inspection was "altogether impossible, and, indeed, if it were possible it would not be safe... I for one, should be very loath to go down the shaft for the purpose of doing some act that was likely to be distasteful to the colliers below". In his report of 1854, Tremenheere, reported "two instances where persons attempted inspection of their own accord, were maltreated, and very nearly lost their lives." I have been married 37 years; it was the practice to marry early, when the coals were all carried on women's backs, men needed us; from the great sore labour false births are frequent and very dangerous. I have four daughters married, and all work below till they bear their bairns (children) - one is very badly now from working while pregnant, which brought on a miscarriage from which she is not expected to recover. I was married at 23 and went into a colliery when I was married. I used to weave when about 12 years old, and can neither read nor write. I work to Andrew Knowles, of Little Bolton, and make sometimes about 7s. a week, sometimes not so much. I am a drawer, and work from six o'clock in the morning to six at night. stop about an hour at noon to eat my dinner: I have bread and butter for dinner; I get no drink. I have two children, but they are too young to work. I worked at drawing when I was in the family way. I know a woman who has gone home and washed herself, taken to her bed, been delivered of a child, and gone to work again under a week. I have a belt round my waist, and a chain passing between my legs, and I go on my hands and feet. The road is very steep, and we have to hold the rope; and, where there is no rope, by anything we can catch hold of. There are six women and about six boys and girls in the pit I work in; it is very hard work for a woman. The pit is very wet where I work, and the water comes over the clog-tops always, and I have seen it up to my thighs: it rains in at the roof terribly; my clothes were wet through almost all day long. I never was ill in my life but when I was lying-in. My cousin looks after the children in the day-time, I am very tired when I get home at night; I fall asleep sometimes before I get washed. I am not so strong as I was, and cannot stand my work so well as I used to do. I have drawn till I have had the skin off me: the belt and chain is worse when we are in the family way. My feller [husband] has beaten me many a time for not being ready. I were not used to it at first, and he had little patience: I have known many a man beat his drawer. I have known men take liberties with the drawers, and some of the women have bastards. I think it would be better if we were paid once a week instead of once a month, for then I would buy victuals with ready money. It is bad to live on 7s., and rent 1s. 6d. I have been hurt once: I got on a waggon of coals in the pit to get out of the way of the next waggon, and the waggon I was on went off before I could get off, and crushed my bones about the hips between the roof and the coals: I was ill 23 weeks. Mr. Fitzgerald and Mr. Fletcher will not have Mr. women in the pits. I have heard of knocks or joults: I had my arm broken by a waggon; I had gotten all out of the road by my arm. and it broke my arm. The women are frequently wicked, and swear dreadfully at the bottom of the pit at each other, about their turn to hook-on. They are like to stand up for themselves; keeping one from hooking-on is like taking the meat out of one's mouth. There are some women that go to church regularly, and some that does not. Women with a family can seldom go to church. Some have a mother to look after. Collier's houses are generally ill off for furniture. I have a table and a bed, and I have a tin kettle to boil potatoes in. I wear a pair of trousers and a jacket, and am very hot when working, but cold when standing still. They beat the children badly; if they are very little they get beat. There is a great deal on managing a house; some can manage better than others; those that can write and have been properly taught can manage best. My husband can read and write. A: Ay, I have worked in a pit since I was six years old. A: Yes, I have four children; two of them were born while I worked in the pits. Q: Did you work in the pits whilst you were in the family way? A: Ay, to be sure. I had a child born in the pits, and I brought it up the pit-shaft in my skirt. Q: Are you quite sure you are telling the truth? A: Ay, that I am; it was born the day after I was married, that makes me to know. Q: Did you draw with the belt and chain? It is now four years since the practice of employing females and very young children ceased in these mines... Since then... marriages have been formed with greater care... few now marry till 23 or 24... On the old system men married more from the advantage of the woman's physical strength, than any degree of affection. When women have children... they are compelled to take them down early. I have been married 19 years and have had 10 bairns (children); seven are in life. I was a carrier of coals, which caused me to miscarry five times from the strains, and was ill after each. My last child was born on Saturday morning, and I was at work on the Friday night. Once met with an accident; a coal brake my cheek-bone, which kept me idle some weeks. None of the children read, as the work is no regular. I did read once, but no able to attend to it now; when I go below lassie 10 years of age keeps house and makes the broth or stir-about. I have been nearly nine years in the pit... I am not paid wages myself; the man who employs me pays my father, but I don't go to Sunday School. The truth is, we are confined enough on weekdays, and want to walk about on Sundays; but I go to chapel on Sunday night. I can't read at all. Jesus Christ was Adam's son, and they nailed him to a tree; but I don't rightly understand these things. 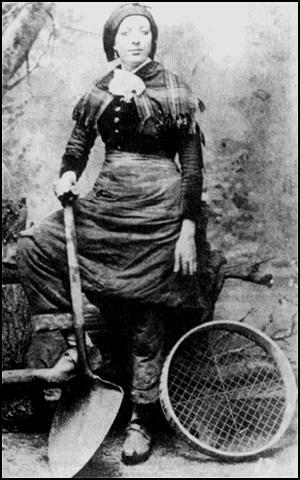 The employment of females of any age in and about the mines is most objectionable, and I should rejoice to see it put an end to; but in the present feeling of the colliers, no individual would succeed in stopping it in a neighbourhood where it prevailed, because the men would immediately go to those pits where their daughters would be employed. The only way effectually to put an end to this and other evils in the present colliery system is to elevate the minds of the men; and the only means to attain this is to combine sound moral and religious training and industrial habits with a system of intellectual culture much more perfect than can at present be obtained by them. I object on general principles to government interference in the conduct of any trade, and I am satisfied that in mines it would be productive of the greatest injury and injustice. The art of mining is not so perfectly understood as to admit of the way in which a colliery shall be conducted being dictated by any person, however experienced, with such certainty as would warrant an interference with the management of private business. I should also most decidedly object to placing collieries under the present provisions of the Factory Act with respect to the education of children employed therein. First, because, if it is contended that coal-owners, as employers of children, are bound to attend to their education, this obligation extends equally to all other employers, and therefore it is unjust to single out one class only; secondly, because, if the legislature asserts a right to interfere to secure education, it is bound to make that interference general; and thirdly, because the mining population is in this neighbourhood so intermixed with other classes, and is in such small bodies in any one place, that it would be impossible to provide separate schools for them. We go at four in the morning, and sometimes at half-past four. We begin to work as soon as we get down. We get out after four, sometimes at five, in the evening. We work the whole time except an hour for dinner, and sometimes we haven't time to eat. I hurry by myself, and have done so for long. I know the corves are very heavy they are the biggest corves anywhere about. The work is far too hard for me; the sweat runs off me all over sometimes. I am very tired at night. Sometimes when we get home at night we have not power to wash us, and then we go to bed. Sometimes we fall asleep in the chair. Father said last night it was both a shame and disgrace for girls to work as we do, but there was nought else for us to do. I have tried to get winding to do, but could not. I begun to hurry when I was seven and I have been hurrying ever since. I have been 11 years in the pit. The girls are always tired. I was poorly twice this winter; it was with headache. I hurry for Robert Wiggins; he is not akin to me. I riddle for him. We all riddle for them except the littlest when there is two. We don't always get enough to eat and drink, but we get a good supper. I have known my father go at two in the morning to work when we worked at Twibell's, where there is a day-hole to the pit, and he didn't come out till four. I am quite sure that we work constantly 12 hours except on Saturdays. We wear trousers and our shifts in the pit, and great big shoes clinkered and nailed. The girls never work naked to the waist in our pit. The men don't insult us in the pit. The conduct of the girls in the pit is good enough sometimes and sometimes bad enough. I never went to a day-school. I went a little to a Sunday-school, but I soon gave it over. I thought it too bad to be confined both Sundays and weekdays. I walk about and get the fresh air on Sundays. I have not learnt to read. I don't know my letters. I have never learnt nought. I never go to church or chapel; there is no church or chapel at Gawber, there is none nearer than a mile. If I was married I would not go to the pits, but I know some married women that do. The men do not insult the girls with us, but I think they do in some. I have never heard that a good man came into the world who was God's Son to save sinners. I never heard of Christ at all. Nobody has ever told me about him, nor have my father and mother ever taught me to pray. I know no prayer; I never pray. I have been taught nothing about such things. A wider interest was secured for the Report by the woodcuts, since they captured the imagination of many who might not have been tempted to read an ordinary Blue Book. Almost more than by their heavy labour, Victorian England was shocked and horrified by accounts of the naked state of some of the workers. It was also alleged that immorality was rife in some pits. Men sometimes worked quite naked alongside women who were commonly naked from the waist up, so that (it was said) the women became debased and degraded. 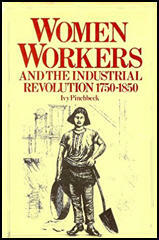 However, the numbers of women below ground were not large - only 2340 in all in 1841. Question 1: Study source 1. Find other sources in this unit that helps to explain the work that this woman is doing. Question 2: Select evidence from this unit that suggests that women in the coalmines did not go to school. Question 3: Explain the problems for married women who worked underground in the collieries. Question 4: According to John Wright, what was the impact of women not being employed underground in the collieries? Question 5: Study source 14. Explain what Ivy Pinchbeck was saying. Use the other sources to help you answer this question. 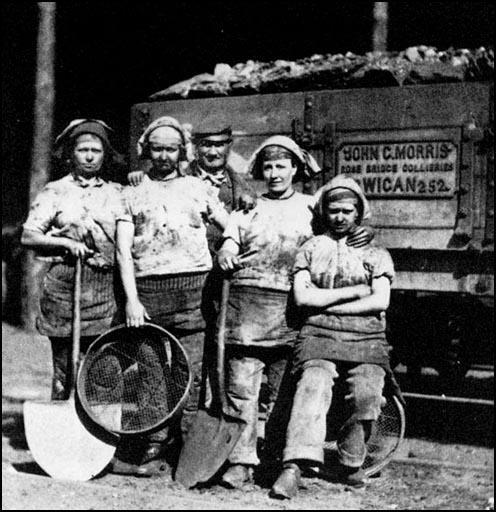 Question 6: Compare the value of the sources in this unit for historians studying the life of women who worked in the coal mines in the 1840s.